The Horseshoe is one of the best known lucky charms in the world and many claim that the tradition of nailing a lucky horseshoe above the doorway originated in Europe, where one can still find them nailed onto houses, barns, and stables from Italy through Germany and up into Britain and Scandinavia. 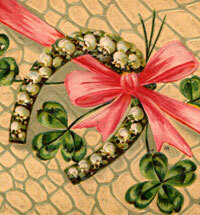 Wreaths and wall hangings made from horseshoes are also extremely popular. In the Middle-East, terra cotta blue-glazed horseshoe plaques are prized. In Turkey small metal or blue glass horseshoes are decorated with the protective "all-seeing eye" creating a charm that repels all evil. In America, England and Ireland, people believe that horseshoes must face upward to catch the luck. In other places in the world, they believe that horseshoes should face downward so that the luck can pour over you. The seven nail holes in a horseshoe invoke the traditionally lucky number 7.
keeping your home free of mischief-makers. 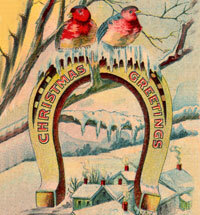 Horseshoes are associated with blacksmiths, and "smithing" is considered an honorable and lucky profession. A witch cannot walk under a horseshoe or she will melt. If the devil gets to close to a horseshoe, he will be drawn into it, like a black hole. A horseshoe in your bedroom will keep nightmares away and allow only good dreams, like a "dreamcatcher." Horseshoes can cure hiccups by simply staring at the horseshoe and wishing the hiccups away. The horseshoe resembles the crescent moon shape of pagan moon goddesses and invites their superior protection.